TV with Thinus: BREAKING. SABC chairperson Ellen Tshabalala publicly asks that people vote for the ANC and makes political statements she is not supposed to do. BREAKING. 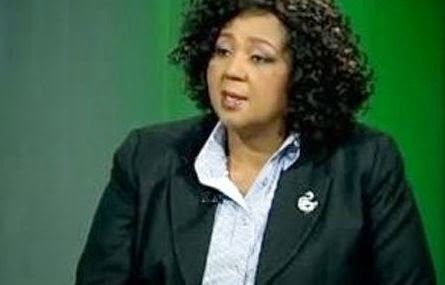 SABC chairperson Ellen Tshabalala publicly asks that people vote for the ANC and makes political statements she is not supposed to do. Over the long weekend Ellen Tshabalala, the SABC chairperson who is supposed to be apolitical publicly as the head of the SABC board and the South African public broadcaster, asked people to vote for the ANC and took a public party political stance by promoting a specific, and the ruling, political party. On Friday Ellen Tshabalala publicly canvassed for votes for the ANC in KwaMashu, telling residents that "there are too many political parties", saying that multiple political parties registered for the May elections are "confusing" and telling residents that "the government knows where it is going". Ellen Tshabalala as SABC chairperson told KwaMashu residents at the event to hand over houses, to vote for the ANC and not any of the opposition parties. In 2012 SABC board member Cedric Gina appeared on SABC News television wearing an ANC shirt at a SABC press conference, showing how far the lines have blurred at the SABC between its role of being a public broadcaster, and having turned into a state broadcaster where SABC board members, and in turn executives, are appointed by the ruling political party. SABC board members, SABC journalists and personnel - although they have personal views and hold party political preferences - are not supposed to speak out publicly or canvass for votes for any specific political party. A month after the results of a scathing PricewaterhouseCoopers (PwC) report into the shocking lack of skills and qualifications at the SABC, as well as a damning report from the Public Protector on abuse of power and maladministration at the SABC - which also implicated the famously matricless Hlaudi Motsoeneng as acting chief operating officer (COO) - Ellen Tshabalala's SABC board has not placed him on suspension and has not made public any actions or direct interventions which have been taken following the reports. On Monday morning the SABC didn't respond to a media enquiry asking if it is still SABC policy that members of the SABC board, SABC personnel and SABC executives be apolitical publicly about political party affiliations and not do public canvassing. The SABC was also asked if there is any comment or response on Ellen Tshabalala's public speaking in KwaMashu. So far there's been no response.